Successful virotherapy of cancer is critically dependent on the ability of oncolytic viruses like vaccinia to overcome multiple defense barriers including the complement/antibody-mediated neutralization , the interferon-induced anti-viral state [2–5], as well as the innate and adaptive anti-viral immune mechanisms mediated by NK and T cells, respectively. Mesenchymal stem cells (MSC) represent a promising delivery vehicle that protects vaccinia virus from the effects of complement/neutralizing antibodies , while also having the unique ability to home to sites of inflammation and tumor growth . This therapeutic platform also takes advantage of the immunosuppressive properties of MSC [8–10], in particular, their ability to survive undetected in allogeneic settings and to transiently counteract the innate and adaptive anti-viral immunity , thus enabling rapid virus spread and colonization of the tumor [12, 13]. We therefore investigated the potential and feasibility of using ex vivo expanded mesenchymal stem cells as a delivery vehicle for oncolytic vaccinia virus. Mesenchymal stem cells can be expanded from various sources including adult bone marrow , adipose tissue , blood, and dental pulp or neonatal umbilical cord, placenta etc. [16–19], and are known to possess potent immunosuppressive properties mediated by IDO [20–22], PGE [23–25], Adenosine , TGFβ [10, 27, 28], VEGF [29, 30], HGF [31–34], iNOS [35–38], IL-10 , HLA-G5 , and Galectins , regardless of the source of origin [16, 29, 41]. Adipose-derived stem cells (ADSCs) isolated from the stromal vascular fraction (SVF) of liposuction aspirates are particularly useful because they are easily available and can be efficiently expanded in culture for different applications [42–45]. Our studies indicate that these carrier cells possess impressive virus amplification potential and the capacity to immunosuppress both the innate and adaptive arms of anti-viral immunity. The immunosuppressive properties of mesenchymal stem cells have been investigated extensively and supported by clinical data demonstrating their ability to avoid immune recognition and survive even in MHC-mismatched allogeneic recipients [11, 46–48]. What remains still unclear, however, is how the immunosuppressive properties of MSCs will be affected by the progression of vaccinia virus infection especially in allogeneic MHC-mismatched settings. Importantly, MSC-mediated immunosuppression is subject to differential modulation by both type I [36, 49] and II interferons [22, 50–55], which are similarly involved in the control of vaccinia virus infection [2, 3, 56, 57]. While type I interferons are secreted by any cell type in response to viral infection, including the MSC, Interferon gamma (IFNγ) is a type II interferon that is produced by a limited number of immune cells like NK, NKT and T cells in response to virus infection  or, as we demonstrate, the carrier stem cells, particularly in some unfavorable allogeneic MHC-mismatch settings. These conflicting roles of IFNγ to limit virus spread through the induction of an anti-viral state but at the same time to stimulate MSC-mediated immunosuppression counteracting anti-viral immunity might prove to be a critically important determinant of therapeutic success. We hypothesized that the immunosuppressive potential of MSCs might be a key factor for their use as a Trojan horse delivery method for oncolytic viruses. It is frequently assumed that the immunosuppressive properties of MSCs would allow them to evade immune recognition and rejection even in highly unfavorable allogeneic settings . 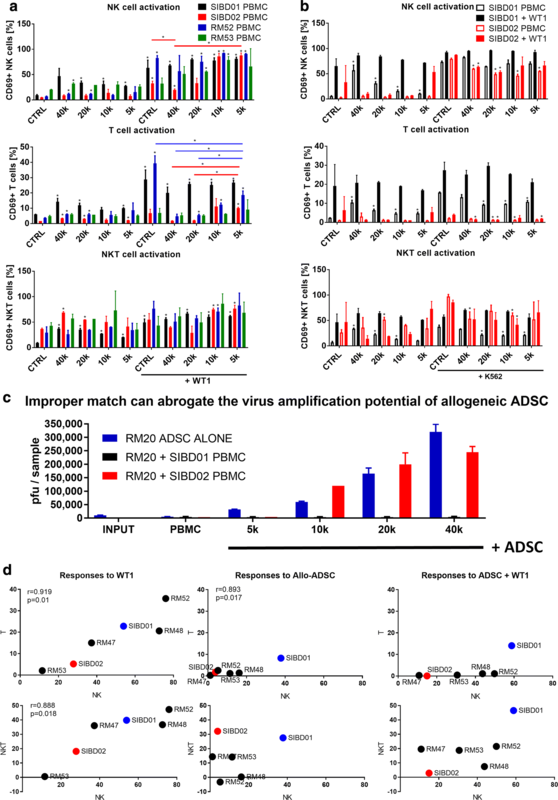 To evaluate the potential of ADSCs to overcome allogeneic immune barriers and function as an effective Trojan horse, we tested their ability to immunosuppress and amplify vaccinia virus in the presence of allogeneic human PBMCs. MHC mismatches can typically trigger both NK and T cell responses, with NK cells representing the most significant initial barrier to both vaccinia virus and the Trojan horse, which is linked to their innate nature, high frequencies and ability to immediately respond to “missing self” due to allogeneic differences or vaccinia virus-induced MHC-downregulation, and without the need for T cell clonal expansion [58, 60]. Surface exposure and upregulation of CD69 and CD107a have been extensively used to study the immunosuppressive effects of MSCs on NK or T cell activation and cytotoxic functions, respectively [61–63]. Preliminary experiments with total PBMC, rather than purified immune subpopulations, indicated that a co-culture of at least 48 h was necessary for consistent detection of largely PMA/Ionomycin-reversible stem cell-mediated immunosuppression (Fig. 3a, b). This was a critical improvement over previous reports that were largely focused on the suppressive effects of MSC on purified NK and T cell populations using longer incubation times and exogenous cytokine support, thus introducing activation bias and ignoring the important role of innate and adaptive immune cell crosstalk [20, 39, 64, 65]. The co-culture with ADSCs demonstrated potent dose-dependent immunosuppressive properties against NK cells stimulated by brief exposure to the physiologically relevant K562 target cells in both autologous and allogeneic settings (Fig. 3a, b, Additional file 3: Figure S3A). Of note, in the co-culture settings the allogeneic stem cells failed to trigger any direct NK or T cell responses, which were decreased below the background levels of activation as measured in the PBMC alone controls (Fig. 3a, b, black bars). We were encouraged by our initial data confirming the immunosuppressive potential of ADSC in allogeneic settings but also wanted to explore the possibility that the actual potency of immunosuppression may be patient-specific and subject to certain allogeneic restrictions. Our optimized co-culture assay was specifically designed to reveal patient/MSC recipient-specific differences in both the immunosuppressive and virus amplification abilities of the stem cells. The therapeutic efficacy of oncolytic viruses is often restricted by the limited permissiveness of the tumor to virus infection and amplification , which reflects patient specific differences, including intrinsic tumor cell resistance , functional interferon anti-viral responses , or the presence of non-permissive tumor-associated stroma [75–77]. In tumors with relatively modest permissiveness, vaccinia virus might have insufficient time to efficiently colonize the tumor before it gets eliminated by the innate and adaptive anti-viral immune responses. Augmenting the oncolytic potential of vaccinia virus in such circumstances might therefore require a strategy that combines efficient delivery with a boosted local virus amplification that together could provide a favorable environment where virus spread and colonization occurs faster than the induction of protective anti-viral state. Given that amplification of the virus in the stem cells proceeds within hours to several days after infection, while it takes more than a week for the adaptive T cell responses to contain virus spread and oncolysis, it becomes evident that the kinetics of the anti-viral/stem cell responses within the first few days of treatment would be critical for the ability of the Trojan horse to have a significant therapeutic effect in vivo. Consequently, the crosstalk and interplay between different innate and adaptive branches of the immune system need to be further investigated as these might be directly associated with the speed and magnitude of the anti-viral/stem cell immunity. The combination of exaggerated innate immune mechanisms sensitizing adaptive immunity against the virus or the allogeneic stem cells can be particularly detrimental. We were very interested by the finding that a patient can be broadly resistant to several allogeneic stem cell lines and that this broad resistance was also associated with unusually high frequency of NKp46 + CD3+ NKT-like cells, which were also the only population that expanded in numbers in response to both the virus and the allogeneic stem cells. Unfortunately, our attempts to link this NKT-like population of cells with effector functions able to directly interfere with the Trojan horse were unsuccessful, as these cells didn’t manifest any significant contribution to IFNγ production or cytotoxic activity. NKT cells are known to play a role in the control of viral infections, but their involvement in vaccinia virus responses and immunity hasn’t been investigated fully yet. The fact that this population of cells is unlikely to be responsible for the direct rejection or inactivation of the Trojan horse does not eliminate the possibility that NKT or NKT-like cells are critically important for directing and accelerating coordinated NK and T cell responses against the stem cells or the virus. Detailed kinetic and mechanistic studies would be necessary to evaluate the possibility that innate immune cells like NKT cells provide early cytokine help sensitizing NK and T cell to the presence of the virus and/or potential allogeneic differences, as suggested by some of our preliminary data (Additional file 7: Figure S7D). The importance of the crosstalk between the innate (NK/NKT cells) and adaptive (B/T cells) arms of the immune system, as revealed by our data, suggests the existence of correlation between patient-specific NK and T cell responses. Despite the rather limited cohort of PBMC donors tested, it becomes evident that patients mount coordinated NK, NKT and T cell responses against the virus and allogeneic stem cells (Fig. 5d). On the other hand, the comparative responsiveness to the virus and stem cells appears discordant and highly patient-specific (Additional file 5: Figure S5C), which cannot be explained by HLA typing data alone and suggests the involvement of innate immunological differences that might not be the same with respect to the virus or possible MHC mismatches. These innate immunological differences can be associated with differences in the NK or NKT cells and more precisely with the balance of signaling through their activating versus inhibitory receptors such as NKG2A/NKG2C/NKG2D or KIR receptors, which like certain HLA alleles are highly patient-specific and have already been linked to resistance/susceptibility to infectious agents, autoimmune diseases, and cancer [81–86]. 12967_2019_1829_MOESM1_ESM.tif Additional file 1: Figure S1. 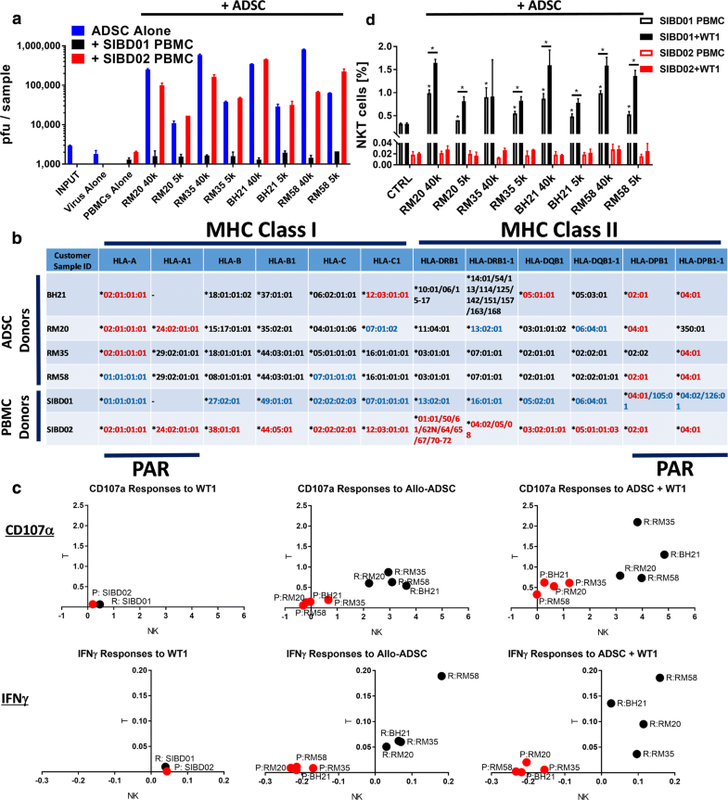 Adipose-derived stem cells provide potent amplification of vaccinia virus that can be restricted by the induction of IFN-mediated anti-viral state. (A) Both type I and II interferons protect ADSC against VV. RM35 ADSC (50,000) were infected in a 12-well plate with 10,000 L14 VV, in the presence of increasing doses (ng/ml) of IFNγ or IFNβ added at the time of infection or 24 h earlier. Fluorescence imaging at 48 h post infection shows that pretreatment with both types of interferon is most effective at conferring protection. (B) The combination of type I and II interferon is not associated with synergistically enhanced protection against L14 VV. RM35 ADSC were pretreated for 24 h with IFNγ and IFNβ alone or in combination before infection with L14 VV as in Fig. 1a. The figure shows interferon-mediated suppression of virus amplification versus no interferon control group (CTRL). (C) RM20-eGFP ADSC (100,000) were infected in a 12-well plate with 100,000 L14 VV and incubated for up to 4 days. Stem cells were either untreated or pre-treated with 20 ng/ml of IFNγ for 24 h administered 1, 2, or 3 days prior to virus infection. The panels show a time course florescence image analysis of uninfected (eGFP+/GREEN) and infected dead (TurboFP635/RED) and infected live (YELLOW)) stem cells visualizing progression of virus infection. 12967_2019_1829_MOESM2_ESM.zip Additional file 2: Figure S2. 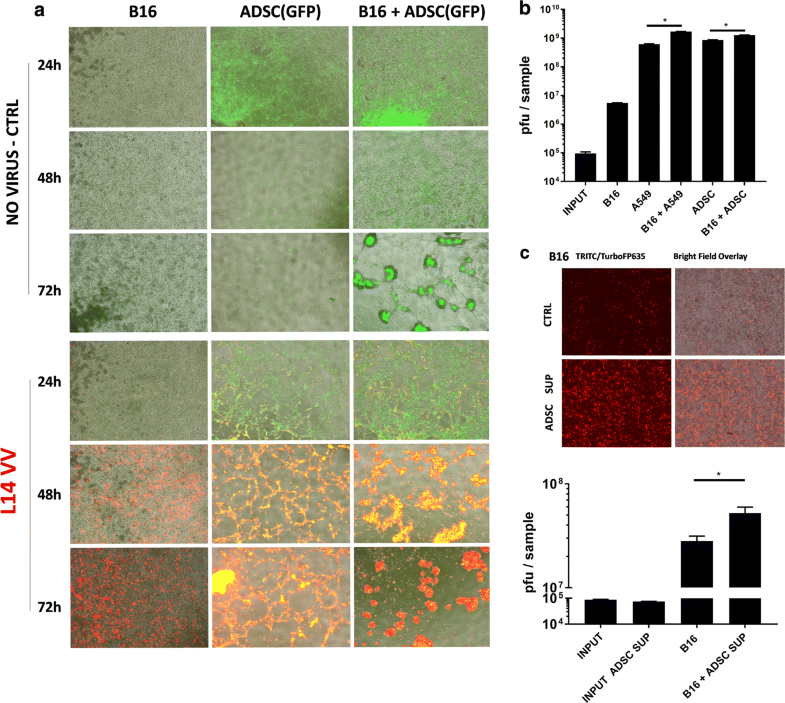 ADSCs promote the oncolysis of resistant tumor cell lines through a combination of virus amplification, tumor cell recruitment and secretion of factors sensitizing the resistant tumor cells to virus infection. 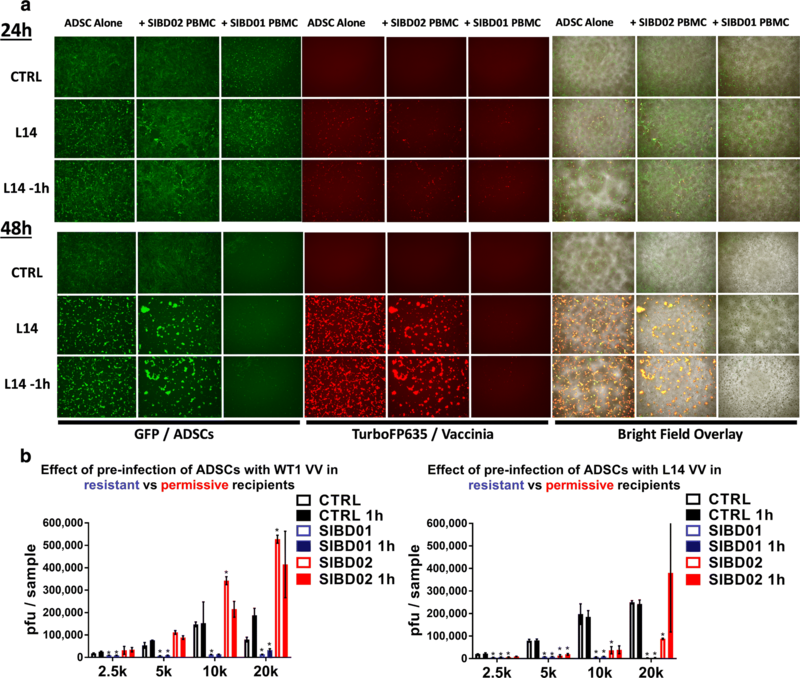 (A) Human ADSC promote the oncolysis of resistant B16 melanoma cells through augmented amplification of the TurboFP635-engineered L14 vaccinia virus. The figure shows fluorescence image analysis of 1 × 106 B16 cells cocultured with 2 × 105 eGFP-labelled RM20 adipose-derived stem cells (4× magnification) in a 12-well plate. B16 and stem cells were infected together with 1 × 105 pfu virus (MOI = 0.1 to B16) and incubated for up to 72 h (data party shown in Fig. 2a). (B) Human RM35 ADSC can also promote the oncolysis of the resistant murine B16 melanoma cells in vitro. Fluorescence imaging analysis of 1 × 106 B16 cells cocultured with 200,000 ADSC and infected with 100,000 pfu L14 VV for up to 4 days. (C) IFNγ pretreatment protects stem cells only in the presence of relatively resistant B16 but not the highly permissive ADSC and A549 cells. 200,000 RM20-eGFP cells (0.2 M) were pretreated with 20 ng/ml IFNγ for 24 h, cocultured with 200,000 (0.2 M) RM20 ADSC, A549 or B16 cells, and infected with the L14 virus as described in (Fig. 2a). Note that IFNγ pretreatment of the stem cells compromised the oncolysis of the B16 monolayer. (D) Insufficient number of stem cells (2% or lower) results in incomplete oncolysis of the B16 monolayer. B16 cells and RM20-eGFP cells were cocultured and infected with L14 as described in (Fig. 2A). To evaluate the role of stem cell number/dose, we compared the oncolysis of the B16 monolayer in the presence of 200,000 (0.2 M) and 20,000 (0.02 M) stem cells. (E) Fluorescence imaging analysis of B16 (10,000) and K562 (100,000) cells infected with L14 virus at MOI of 0.1 for 96 h in 96-well flat-bottom plates in the presence of ADSC supernatants from different stem cell donors as indicated. (F) Plaque assay analysis of L14 (top) and WT1 (medium) vaccinia virus amplification in B16 cells as in (E) and MTT assay showing the absence of significant impact of ADSC supernatants alone on the survival of the infected B16 cells (Bottom). (G) Flow cytometry analysis of ADSC supernatant-potentiated infection of K562 cells as evidenced by slight increases in the frequency of infected cells, TurboFP635 + MFI, and viral titers, but lack of a significant effect on the overall survival of the highly resistant K562 cells, as measured by the MTT assay. (H) K562 cells were infected with L14 VV at MOI of 0.1 as in (E) but instead of supernatants K562 cells were cocultured with 5000 or 20,000 RM20-eGFP ADSCs in triplicates. Fluorescence imaging and flow cytometry analysis were used to show that the green fluorescent stem cells attract the unlabeled/grey K562 cells and dramatically increase the percentage of infected eGFP-negative TurboFP635 + K562 cells. Despite the potentiated infectivity of the highly resistant K562 cells, the stem cells ultimately fail to eradicate or significantly impact their overall survival, consistent with the minimal ability of these cells to amplify vaccinia virus, as shown in the NCI-60 human cell line screen previously. Statistically significant differences (Student T-test, p < 0.05) based on duplicates or triplicates versus control or as indicated are marked with asterisks. 12967_2019_1829_MOESM3_ESM.tif Additional file 3: Figure S3. 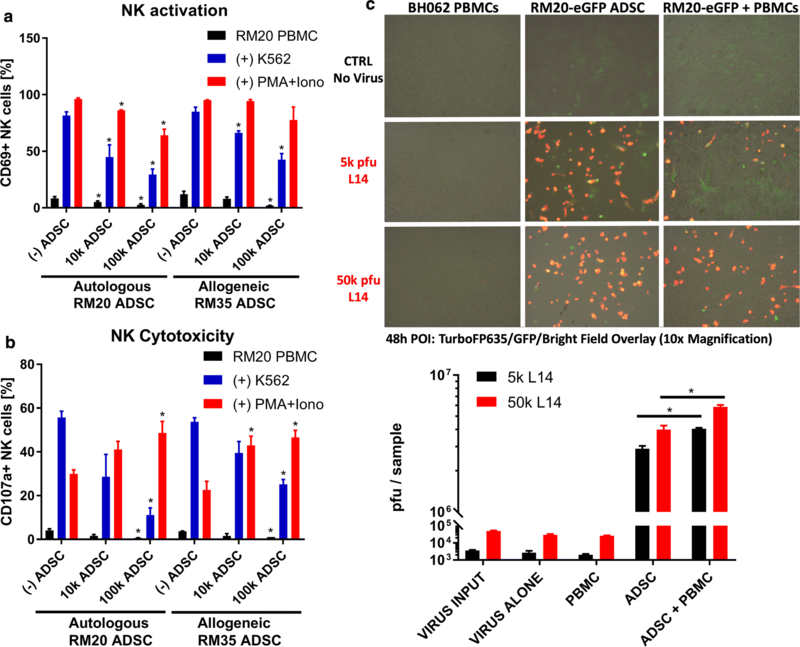 ADSC are suppressive against NK cells and can overcome allogeneic immune barriers. (A) ADSC-mediated immunosuppression does not affect the frequency of NK and T cells. Note that the PMA-Ionomycin treatment causes downregulation of the NKp46 marker used to identify and gate on NK cells, resulting in “disappearance” of the most activated NK cells. 12967_2019_1829_MOESM4_ESM.tif Additional file 4: Figure S4. The potential of allogeneic stem cells to overcome immune barriers correlates with their ability to suppress virus-induced T, NK and NKT cell responses. (A) Gating strategy used to evaluate the effect of ADSC and vaccinia virus on activation of T, NK, and NKT-like cells as measured by upregulation of surface CD69 expression. (B) Summary of the modulation of the three immune cell populations as percentage of gated live lymphocytes in patients RM047 and RM048 (See Fig. 4b). 12967_2019_1829_MOESM5_ESM.tif Additional file 5: Figure S5. The potential of allogeneic stem cells to function as a Trojan horse is restricted by patient-specific differences suggesting that proper matching would be required. (A) Patients demonstrate highly variable responses to the allogeneic stem cells and the virus alone or in combination. Flow cytometry analysis of gated live NK, T, and NKT cells from the 48 h cocultures of 250 k PBMCs from 4 different blood donors with 5–40 k allogeneic RM20 ADSC in the presence or absence of 5 k pfu of WT1 VV. Data show the percentage of each gated cell type in PBMC. (B) Flow cytometry analysis of cocultures of PBMC from the SIBD01 and SIBD02 blood donors as in (A) followed by a 4 h stimulation with K562 cells to evaluate the extent of NK cell suppression. (C) Correlative analysis of NK, T, and NKT cell responses (% CD69+ normalized to untreated control) against the WT1 virus, the allogeneic ADSCs or the combo as in F5A, partly shown in F5D. (D) Lack of correlation between NK, T and NKT responsiveness to the virus versus the allogeneic ADSC as in Fig. 5d. Statistically significant differences (Student T-test, p < 0.05) based on duplicates versus corresponding PBMC alone controls (CTRL) or as indicated are marked with asterisks. 12967_2019_1829_MOESM6_ESM.tif Additional file 6: Figure S6. Patient-specific immunological barriers to the Trojan horse can limit the therapeutic potential of both genetically attenuated and wild type vaccinia virus strains. (A) Plaque analysis of supernatants after 1 h pre-incubation with ADSC in 37 °C incubator with constant shaking showing that at MOI of 1 (Ratio of VV to ADSC = 1) approximately half of the INPUT vaccinia virus gets attached or integrated in the pelleted cells and is absent from the supernatant. At higher MOI (fewer stem cells) most of the virus appears to remain free and requires longer time to integrate. 12967_2019_1829_MOESM7_ESM.zip Additional file 7: Figure S7. Patients’ resistance to the Trojan horse is associated with critical HLA mismatches and the rapid induction of anti-stem cell cytotoxic and interferon responses. (A) The top table shows analysis of KIR Haplotypes as well as the presence of known KIR ligands including the Bw4 epitope (HLA-B) and the weak/strong C1/C2 epitopes (HLA-C). This table also includes analysis of the oligomorphic MICA/B molecules that serve as ligands for NKG2D activating receptors on NK cells. The bottom table shows the distribution and copy number of long(L)-inhibitory and short(S)-activating KIR receptors, with the total number of inhibitory and activating receptors present also summarized in the top table. Note the absence of clear correlation between permissiveness/resistance and KIR haplotype/KIR ligands, − 21 M/T dimorphism, and MICA/B oligomorphism. The RM58 stem cells manifest a potentially important KIR ligand C1/C2 mismatch with both the resistant SIBD01 and permissive SIBD02 blood donors, suggesting that such a mismatch alone is insufficient to confer resistance, which might also require additional and stronger HLA mismatching. (B–F) Flow cytometry analysis of gated live NK, NKT and T cells from the PBMC/ADSC/WT1 co-cultures, as in main Fig. 7, showing that all the 4 allogeneic stem cell lines tested induce much stronger CD107α and IFNγ responses in the NK and T cells from the resistant but not permissive blood donor even in the absence of the virus. The figure shows the average frequency and total numbers of IFNγ (B) or CD107α (C) single positive as well as the much lower-frequency IFNγ plus CD107α-double positive lymphocytes of each cell type. (E) Complete correlative analysis of gated live NK, NKT and T cells from the PBMC/ADSC/WT1 co-cultures as above (partly included in main Fig. 7c) showing the average percentages of CD107α or IFNγ single positive lymphocytes of each cell type based on triplicate wells and normalized to respective background (untreated controls). (F) Flow cytometry analysis as above showing that treatment with vaccinia virus or allogeneic stem cells doesn’t affect significantly the frequency of the gated lymphocyte populations, with the exception of the NKT-like cells from the resistant SIBD01 blood donor that expanded in response to the allogeneic stem cells alone and further in the presence of vaccinia virus infection. (G) NKT-like cells are the earliest produces of IFNγ. RM20 ADSCs (10,000 or 2000) were co-cultured with PBMC (250,000) from the resistant SIBD01 or permissive SIBD02 blood donors and WT1 VV (5000 pfu). Gated live NK, NKT and T cells were analyzed by flow cytometry for activation (CD69 surface stain) and effector functions (intracellular stain for IFNγ) at 6 h and 24 h timepoints. (H–J) Flow cytometry analysis of gated NK, NKT, and T cells from the PBMC of a resistant and several permissive blood donors co-cultured with allogeneic RM20 ADSCs untreated or pre-treated with 20 ng/ml IFNγ for 48 h. IFNγ pre-treatment enhances rather than suppresses NK and T cell responses in the permissive patients, in the presence (H) but also absence (I and J) of vaccinia virus. The data in (I) and (J) experiment also demonstrate that a later passage of the RM20 stem cells (p12) retains some T cell immunosuppression ability but loses ability to suppress NK cells. Stimulation of NK cells with K562 induces indirect T and NKT cell responses indicative of NK-NKT-T cell crosstalk. Data represent mean and SD of duplicate or triplicate wells showing % of gated population of cells or total number of cells. Asterisk was used to mark statistical significance (Student T-test, p < 0.05) relative to group control or between groups as indicated.